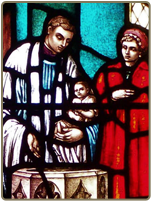 Holy Baptism is the basis of the whole Christian life, the gateway to life in the Spirit and the door, which gives access to the other sacraments. Through Baptism we are freed from sin and reborn as sons God; we become members of Christ, are incorporated into the Church. Classes are held for parents and godparents.